Take your day on the water to the next level by renting from G Rides. For over 17 years, we have provided adventure seekers the newest water sports equipment technology from leading manufacturers in the industry. Our experts on Norris Lake can match you with the best rental that fits your riding style. Not only that, but we can also give you helpful riding advice to enhance your skills. Besides equipment rentals, we sell fashionable swimwear and surf-inspired clothing as well. Our apparel and accessories are designed specifically to be worn around water. Whether you're looking to buy board shorts or sandals, we have it all. When you're looking for advice on how to have fun on Norris Lake, our team is the perfect resource. Led by our owner, Nik, we love helping water sportsmen and women have a blast on the water. Let us recommend you the best water sports equipment rentals—visit our wakeboard pro shop soon so that we can help you make your next day on the lake extra exciting. 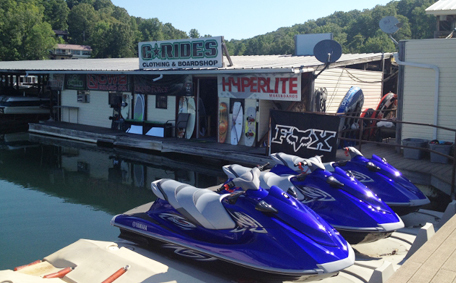 We are located right on the beautiful waters of Norris Lake at the Springs Dock Marina.